Just wanted to say thanks for the great lesson it gave me bags more confidence in myself I never thought I’d be doing small jumps and drops in my first lesson and be happy in knowing the best way to tackle them. Thanks for the videos and info you sent, I’d love another private lesson and join one of your group sessions in the near future. Mark (Beginner MTB Skills Course). Thank you for today. An excellent course and we both feel we progressed. Was unsure of the approach at first but a great way of getting things to sink in and then applying it in action. Feel much more confident on jumps and drops rather than relying on instinct and memories of a miss spent youth at the BMX park. 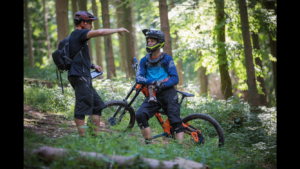 Steve (E-MTB – Mountain Bike Skills Course). Just wanted to email to say thanks for the training session. Really glad we came down. I feel much more confident on trails now that I’m not just hitting stuff and hoping I’m doing it right. We went down the full Surface To Air after we finished the session and we only didn’t do the final sender. Took me a good 15mins to build up to do the steep drop that’s on the corner just before the ladder, but I ended up doing it twice. You get some great speed for the step up on the other side. We then hit Stile Cop the next day and I could really put everything into practice. Did the Red Course about 6 times and my times massively improved by the end. Felt a lot faster than I’ve ever ridden. Tom (Downhill MTB Skills). Many thanks for the session today – we both learned stacks, had a laugh and enjoyed the stunning morning light.Your teaching style is outstanding and you ability to remodel your programme on the fly is refreshing and rare. I am a high level instructor within the British Sub-Aqua Club, and instructor trainer and an examiner So I get to see a lot of instruction. Today was lots of fun, Nick (Small Group MTB Skills Course). Cheers Ian for the Devo today. Felt like that was the key to unlocking the next level of riding potential. Quality of tuition was second to none. Learned so much. 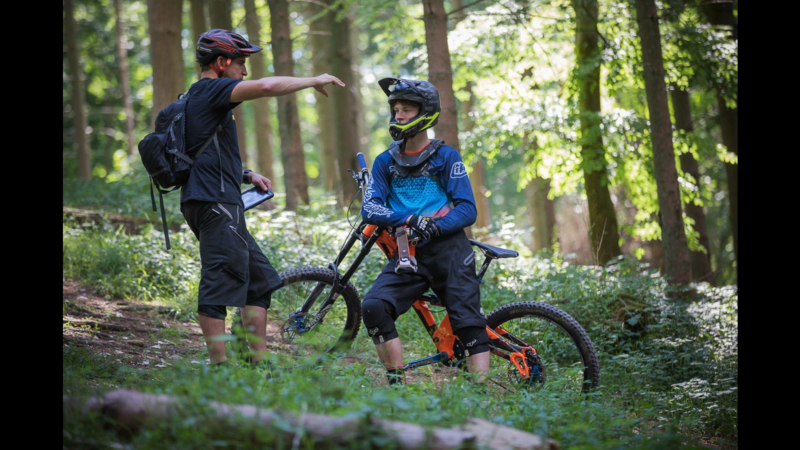 – Ed (Adult Rider Development Programme – DeVo). Thanks for the excellent tuition yesterday, we all found it very valuable & I for one definitely have some things that I can work on! Although it’s a bit of a trek for us, we will certainly be back at Aston Hill later in the year. Many thanks, Mark. (Group course featuring Jumps and Drops). Ian – the guys had a really great time on Sunday and are keen to progress – certainly worth all that effort trying to find a date to fit it in! I’ll give you a call when they’re ready for another session or possibly a DeVo programme. Thanks, Jane (Small Group – Downhill, Jumps and Drops Course). Thanks very much for a great coaching session today. I learnt a lot, improved my confidence a lot (especially with bombholes) and took away some really good skills sessions to practice in the drive. Your enthusiasm, encouragement and honesty are shone through. I’ve already recommended your course to a colleague at work. It’s a good course you’ve built up. All the best. Mark (1-1 XC Course). Thank you for Sunday’s tutorial it was very informative and professional. I had to give back the Yeti on Monday but hope to have my bike soon so i’ll let you know how i get on. Thanks again from James and me and hope to see you in the future some time. Rob (Small Group – Jumps and Drops Course). Hi Ian, Thanks for the course last night, very impressed with the content and the presentation. Can’t wait to get out on the hill and practice now! Si, (1-1 Downhill Course). Ian, Quick note to Thank You for the course yesterday, it was really informative and I felt it’s helped my riding no end. Neil (1-1 Downhill Course). Ian, Firstly Stuart, Stefan, Zoe & I would all like to thank you very much for the training given a couple of Sunday’s ago. We all found it to be very useful and also enjoyable. We will definitely be back for more in the future. Tracy (Small Group – XC Course). Hi Ian, First of all i’d like to thank you for giving us all a great day! we learnt loads, and after you left we all continued to practice what you taught us and had a great time! Cheers, Daniel (Small Group – Downhill). Hi Ian, Thanks for a thorough and enjoyable training session on Sunday, Sean and I both learnt a great deal and are looking forward to returning to the hill very soon to put it all together! Cheers, Corin (Small Group – Downhill, Jumps and Drops).